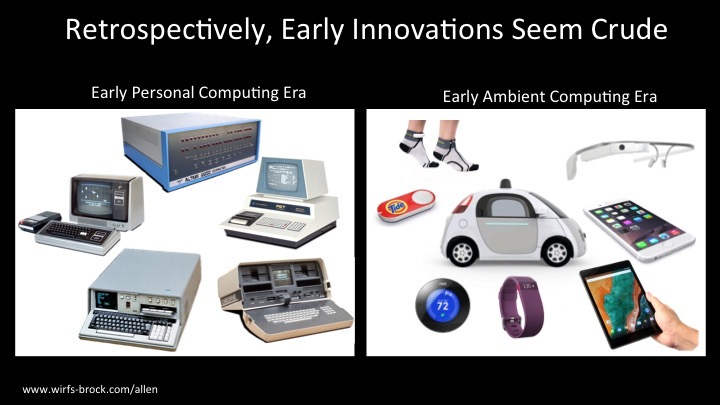 The chaotic early days of a new computing era is an extended period of product innovation and experimentation. But both the form and function of new products are still strongly influenced by the norms and transitional technologies of the waning era. New technologies are applied to new problems but often those new technologies are not yet mature enough to support early expectations. The optimal form-factors, conceptual metaphors, and usage idioms of the new era have yet to be fully explored and solidified. Looking back from the latter stages of a computing era, early era products appear crude and naive. This is a great time to be a product innovator or an enthusiastic early adopter. But don’t get too comfortable with the present. These are still the early days of the Ambient Computing Era and the big changes are likely still to come.